First discovered by ESET malware researcher Lukas Stefanko, the 19 apps he tested were navigation apps with over 1 million installs each, totalling a combined install base of more than 50 million. 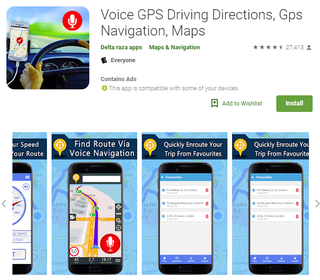 Sadly, despite claims that these apps can help users map their routes or include tools such as a compass or speedometer, every single app ended up relying on Google Maps or its related API to perform the real work. The main difference between these knock-off apps and real Google Maps usually came down to a redesigned home screen with a tweaked or sometimes stolen UI that functioned as a way to serve up ads while also masking the fact the app was really running off of Google’s data all along. Stefanko has since reported the 19 offending apps he found, and while some like the one pictured above are still available, others have already been removed from the Play Store.